18K Strawberry Gold® Blueberry Zircon™ 3 3/4 cts. Earrings with Vanilla Diamonds® 1 cts. Zircon is the oldest mineral on earth, dating back 4.4 billion years. Its name comes from the Persian “Zargun”, which meaning golden color. Zircons can survive geological processes like erosion, transport, and even high-grade metamorphosis; as a result, they contain a rich and varied record of these processes, adding to their unique allure. There are many colors of Zircon including yellow, orange, brown, green, red and blue, the latter of which Le Vian® has chosen to introduce as Blueberry Zircon™, its newest gemstone flavor. 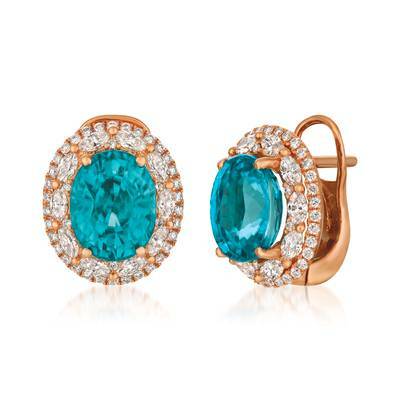 Le Vian® Blueberry Zircon™ can only be found in Cambodia, is chosen from the top of production and displays a unique blue color with green tones, which sometimes causes it to be mistaken for a Paraiba Tourmaline. It is a very highly refractive gem with a hardness of 7.5 and a vitreous luster. Blueberry Zircon™ has the unique characteristic of being double reflective which means you see twice as many facets and twice as much fire. Larger sizes of Blueberry Zircon™ are extremely rare, almost nonexistent, with only 5 or less pieces of 30 carats or more discovered in the last year. Le Vian® is popularizing this ancient and rare gem as a salute to its 2017 Color of the Year, Blues™.